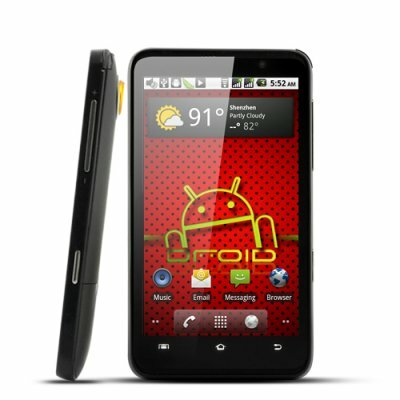 Successfully Added Android Phone "Aurous" - 4.3 Inch Capacitive Touch Screen, Dual SIM, WiFi to your Shopping Cart. Introducing the Aurous Android 2.2 Smartphone with a 4.3 inch HD capacitive touchscreen, the number 1 eye-pleasing Android smartphone on the market that is simply bigger, brighter, and better. Size has never mattered more because everything looks better and clearer thanks to the Aurous's vibrant, bright, and massive 4.3 inch capacitive touchscreen. At 800 x 480 resolution, this is the true way to experience your smartphone as videos look better, games are more exciting, and your eyes will be stuck to the screen for longer. Gone are the times when you had to squint to see the text on your phone, gone are the spelling mistakes when texting on the mini virtual keyboard; With the Aurous, just sit back, relax, and enjoy your smartphone. With Android 2.2, the Aurous Android smartphone comes with everything you need to organize and manage both your personal and day-to-day work activities. On the social side, it's easy to keep connected with all your friends and family through the integrated applications like Gmail, Facebook, Twitter, and MSN. For entertainment, enjoy music, YouTube videos, or popular games (like our favorite, Angry Birds) with a single touch. For everything else there's the Android marketplace, home to thousands of new games, wallpapers, applications, and more - all accessible from the convenience of your smartphone! What more do you want from a smartphone? Definitely not a 2 year plan with your local phone company, which is why the Aurous Android smartphone comes unlocked and ready to go. Use it with any GSM provider worldwide and you can enjoy the same features no matter where you are. Even better, this phone features dual SIM card slots, allowing you to use two active phone numbers in one phone! This is the perfect solution for business people or travelers on the go and is unheard of for branded Android phones. Your choices for a great Android smartphone just got a lot bigger with the Aurous. Whether you need one for personal use, or want to profit from selling on your own wholesale website, the Aurous is a guaranteed hit. This Android smartphone is also available with a 12 month warranty, next day shipping, and dedicated customer service team, so wait no longer and order now. Brought to you by Chinavasion, the number 1 wholesale choice for high quality Android smartphones. This is one of the best smartphones that i have purchased yet.That's why i'm getting ready to purchase another one in a few days.This Androit Aurous 2.2 Capacitive is very fast,and takes Highdefinition pictures,very clear videos.Download fast.I been told by my friends that this phone is a 4G that's how fast it is..
Ive used the Aurous for about 6 months and Ive never had a better phone. Together With Simple Mobile you cant go wrong. FYI The covers that fit the HTC of the same size will also fit this phone. I suspect the batteries will also interchange but you get two with the Aurous so no worries. The only weakness is that Android eats power so you have to tweak your settings if you want your battery to last all day. No worries, its a snap. The phone is simply sleek and beautiful,. on 2012-02-26 00:03:18 First glance of this phone...in the buying mood already. Im just waitng for my Tabulus Tablet order thru a friend. Upon recieving if its OK then i will start from there. But your products and its prices are extremely new to my eyes. I love it and i will surely recommend this to my friends.